I write this post mostly to share my excitement over a recent acquisition. 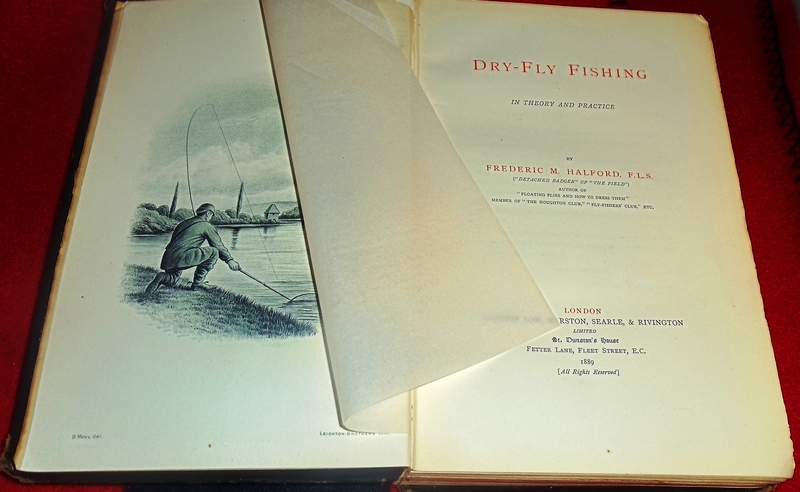 I was able to pick up a frist edition of Frederick M. Halford’s Dry-Fly Fishing, in Theory and Practice, published in 1889 by Samson Low, Marston, Searle, and Rivington, Ltd. in London. Most fly fishers know Halford as an advocate of dry fly fishing, particularly when it comes to fishing the essentially manicured chalk streams of England. Many first-class fishermen say that they do not care for grayling fishing, possibly because they have never really tried it, or equally possibly because they are not quite right–I will not say straightforward–but disingenuous and candid in the opinion they are giving. Then they quote Cotton, who wrote that extraordinary sentence about the grayling being the deadhearted fish that swims. Cotton certainly never killed a three-pound grayling on a Test shallow; if he had, with his power of discrimination and strong desire for truth, he could not have written that sentence. Some fishermen have even been heard to say that they wished the last pike in the Test might be choked in the act of swallowing the last grayling. This, however smart it may sound, is childish and selfish, as many fishermen consider that grayling fishing is quite as good in its way as the trout, and with these I wish to be numbered. 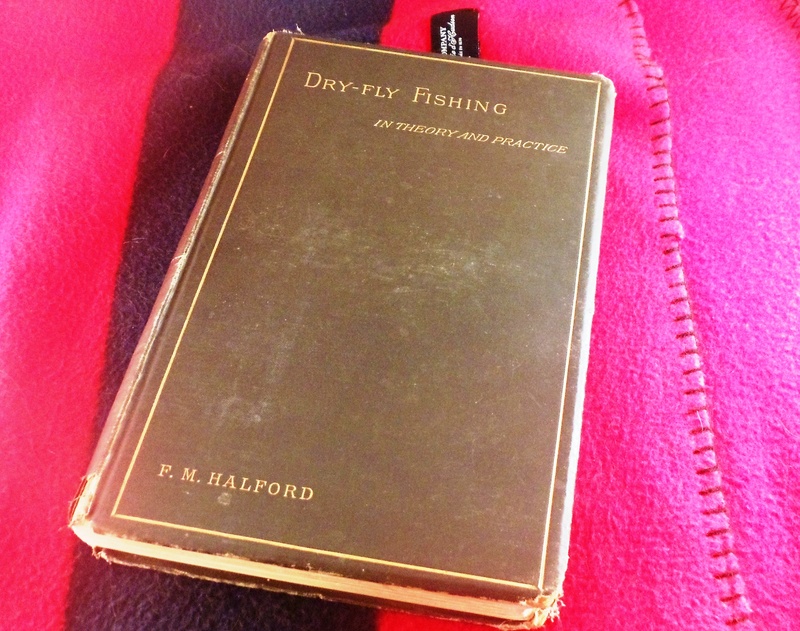 (Halford, Dry Fly Fishing, 251-252). In treating of the advantages of the dry-fly over wet-fly fishing, I am most desirous of avoiding any expression which should tend to depreciate in any way the skill exhibited by the experienced and intelligent followers of the wet-fly. They require not only most undoubted judgement of the character of water frequented at various times of the day and season by feeding fish, not only a very full knowledge of the different species and genera of insects forming the food of the fish, not only a full perception of the advantages of fishing up-stream under one set of conditions and of fishing down-stream under others; but, in addition to all this, great skill in placing their flies accurately in the desired position, and allowing them to drift down in a natural matter and without any drag or check over the precise spot they wish to fish. There is far too much presumption of superior scientific knowledge and skill on the part of the modern school of dry-fly fishermen, and I should be the last to wish to write a line tending to encourage this erroneous assumption of superiority, or to depreciate in any way the patience and perseverance, coupled with intuitive perception of the habits of the fish, requisite for a really first-rate performer of the wet fly (Halford, Dry Fly Fishing, 3). I think Halford is written off by most American fly fishers today. This was not always the case, though. Among those who are best known for advancing “technical” fishing in the US, he was quite popular. Of course, the foremost of these figures are Vince Marinaro and Charlie Fox, who fished the Pennyslvania “Limestoner” equivalents of the English chalk streams. Prolific journalist, writer, and fly fisher, Alfred Miller (AKA “Sparse Grey Hackle”) wrote, “These Pennsylvania boys laugh at the idea that the pattern doesn’t matter if you handle it correctly and insist tha it is necessary to imitate exactly the hatch on the water, use fine gut, and fish delicately and far off to achieve consistent success. They read Halford and believe what he says. Their average knowledge of stream entomology would put the average Angler’s Club [of New York or London] member to shame, and they keep emergence tables, either mental or written, as a matter of course. And they put their fish back (Alfred Miller, Limestone Legends: The Fly Fishers’ Club of Harrisburg, 1997, 95). So, while Halford’s stodgy reputation seems to be undeserved, it is certainly the case that his emphasis upon entomology and “matching-the-hatch” was influential. No doubt, this is largely because the crystal clear, food-rich chalk streams of the UK and limestone creeks of the US are immensely difficult to fish. The western US fisher who claims that Idaho’s Silver Creek or the Henry’s Fork are the most difficult waters to fish in the world, then, might do well to remember that other skilled fly fishers have been dealing with similar challenges for a very,very long time. Who knows? That same western US fly fisher may actually pick up a tip or two from Halford, who was not so rigid in his techniques as he is now remembered. This fly fisher might also consider the fact, too, that Halford and Marinaro often crawled to their streams, in order to avoid spooking fish. While I’m sure it has happened plenty of times, I have yet to see someone do this on the Henry’s Fork. This entry was posted on August 15, 2012 at 10:17 PM and is filed under Fly Fishing, Fly Fishing Literature. You can follow any responses to this entry through the RSS 2.0 feed. You can leave a response, or trackback from your own site.